Lifestyle Magic - how to live green. In the last post (yes, its been a while!) I talked about free cellulases. The problem with free cellulases is recovery and that you need several different types of cellulases to work together to accomplish the breakdown of cellulose. What if you could have a scaffold that did that for you? Bacteria and fungi have done just that and its called the cellulosome! 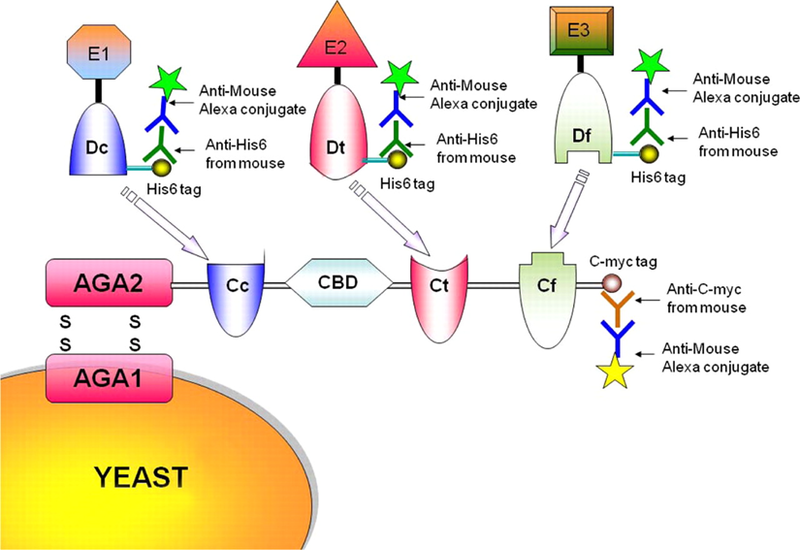 Of course, its a complex structure but the basics are illustrated in Figure 1. The cellulosome consists of several different parts. First a protein known as scaffoldin is attached to the bacterial (or fungal) cell. Scaffolding contains domains known as cohesins and carbohydrate binding proteins (binding to cellulose for example) and a domain with surface layer homology of unknown function (2004); cohesins bind a second type of protein called dockerins and dockerins bind the cellulosome enzymes that degrade carbohydrates, cellulose being just one of those carbohydrates. There are different types of cohesins (type I-III in 2004) and they bind different classes of dockerins (types I-III) through a small binding site of four amino acids. Which dockerin binds to which cohesin is highly specific. 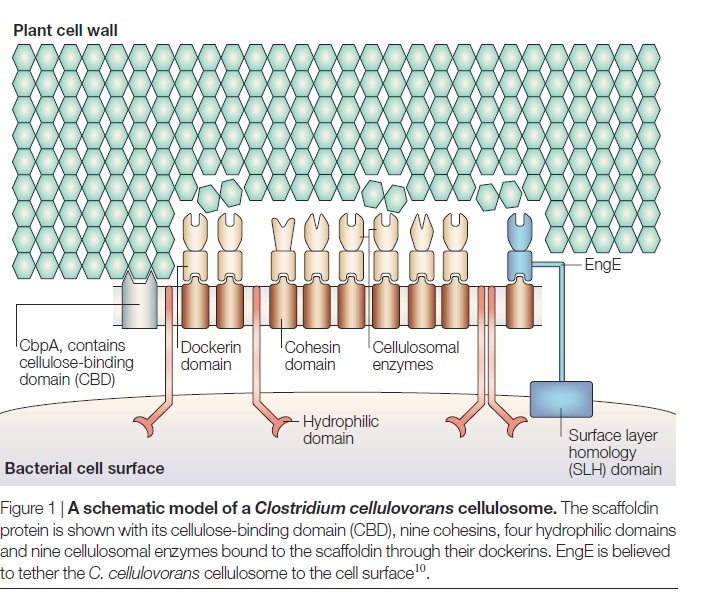 Figure 1 shows a fairly simple representation of a cellulosome. Other micro-organisms have more complex structures involving 3 different scaffoldin proteins that link together. Interestingly, the presence of cellulosome genes in an organisms genonome does not necessarily mean it can degrade cellulose. Developing an efficient and robust cellulosome containing the enzymes that work effectively together is then the job of the lignocellulose biochemist. To this end, researchers have been working on designing minicellulosomes. We already know that Saccharomyces cerevisea is a organism of choice in the fermentation of glucose to produce ethanol due to its tolerance for high ethanol concentration (see blog post#). S. cereviseae is also a good choice because its genetics are well studied with many tools available for gene manipulation. Further, yeast is able to "display" proteins on its surface. i.e. it can display a cellulosome on on its surface meaning that not only will it do the expression but it puts the whole system together and presents it on its surface. The scientist, doesn't need to purify the proteins and put them together herself. Because of the genetic tractability, different cohesins from different organisms can be mixed and matched to produce the most efficient cellulosome, unavailable naturally. Tsai et al, 2009, put together cohesins from 3 different bacterial strains and displayed them on the yeast cell surface (figure 2). The antibodies (upside down green and blue and brown Y shapes with yellow or green stars) were used to detect the expression of the different components ofn teh surface of the yeast. Figure 2. Functional assembly of minicellulosomes on the yeast cell surface. A trifunctional scaffoldin (Scaf-ctf) consisting of an internal CBD flanked by three divergent cohesin (C) domains from C. thermocellum (t), C. cellulolyticum (c), and R. flavefaciens (f) was displayed on the yeast cell surface. Three different cellulases (E1, E2, and E3) fused with the corresponding dockerin domain (either Dt, Dc, or Df) were expressed in E. coli. Cell lysates containing these cellulases were mixed with yeast cells displaying Scaf-ctf for the functional assembly of the minicellulosome. The authors showed that this cellulosome was 2.6x more efficient than if the enzymes were added in their soluble form and ethanol production was 95% of its theoretical value! This blog is changing direction synthetic biology is taking over. Microbiology and Biochemistry can come together! This is an unrelated topic but one I feel strongly enough to make a post.I recently read this book by Carl Hart and can't recommend it highly enough. Drug abuse is caused by poor education, prejudice and poverty. Drug abuse does usually not lead to this or to crime. Open your mind and get out of the media and political brain washing that is pervasive in our culture about so many things including drug use, race and gender. 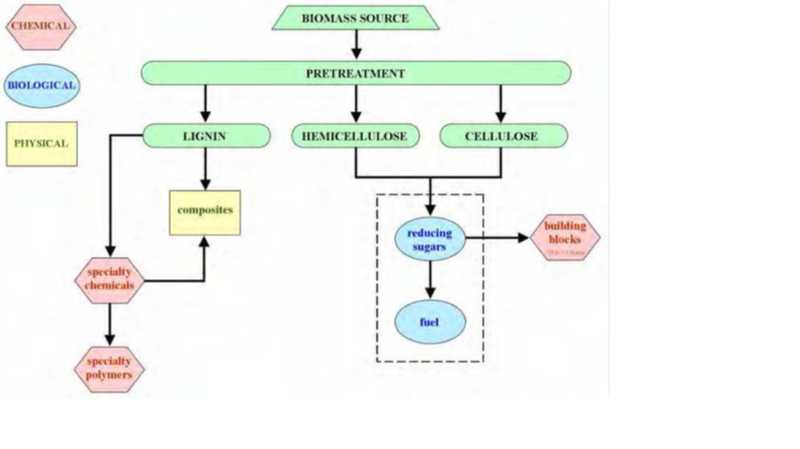 Following pretreatment and prior to fermentation, the broken down components of lignocellulose (lignin, celluose and hemicellulose) are subjected to enzymatic action. Actually, its economically favorable to combine hydrolysis and fermentation, but lets first look at how cellulose is broken down for fermentation? Pretreatment opens up the lignocelluose but not to its monomeric form and before it can be used as an energy source it needs to be broken down much more. How does this occur? Enzymes! In particular, one enzyme, cellulase. Well, actually one class of enzymes; one very large class, grouped together by their ability to hydrolyze the beta 1,4 glycosidic bond (see my last post). One of the reasons for the huge diversity of cellulases is that their substrate, cellulose, comes in many different forms and cellulases have evolved to suit their purpose. If you want to delve into cellulose structure, see this video and this link. Micro-organisms produce many types of cellulases and they work synergistically. The subject is complex and we'll skim the surface. 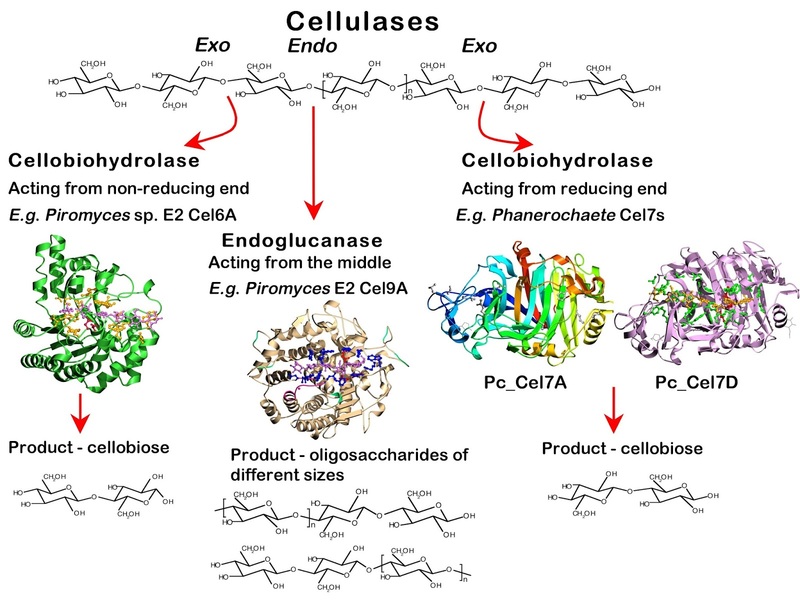 Cellulases can be classified in a number of different ways depending on what you are interested in: by structure; by sequence; by enzyme mechanism; by substrate etc. One of the most widely used classification systems is the Carbohydrate-active enzymes database, or CAZymes which is based on sequence similarity. In CAZymes, enzymes are grouped into enzymatic groups through their sequence similarity and cellulases fall into the glycosidic hydrolase (GH) group. Cellulases can be further classified into four subclasses that are commonly used in lignocellulase breakdown. 1.Endocellulases bind randomly along a cellulose polymer strand and make several cuts before releasing. 2.Exocellulases (also known as cellobiohydrolases) bind from one end of the cellulose polymer and further bind at either the reducing end or the non reducing end (see my last post on cellulose structure). The polymer strand gets fed into the exocellulose and a D-glucose dimer (cellubiose - figure 2) is cut off, one at a time as the enzyme moves along. This ability - to move along the polymer - is called processivity. 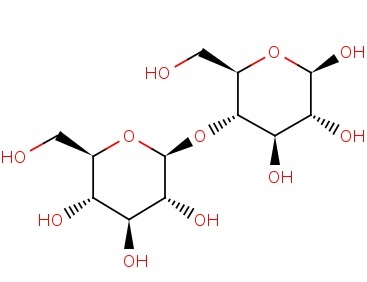 3.Endoglucanases bind to the cellulose polymer, make a cut like an endocellulase and then moves processively along the strand, releasing cellotetraose (figure 3) rather than cellobiose. 4.beta glucosidases cellobiose (and cellotetraose?) into the glucose monomers. Additionally there are other proteins such as swollenein that insert themselves inbetween the strands of cellulose in crystalline cellulose and help to break it apart. One aspect that makes these enzymes a little different is that their substrate is generally insoluble. Therefore the enzymes are often secreted by the micro-organisms that makes them and must diffuse to the substrate rather than the substrate diffusing to the enzyme as is common if the reaction is occurring inside a cell. 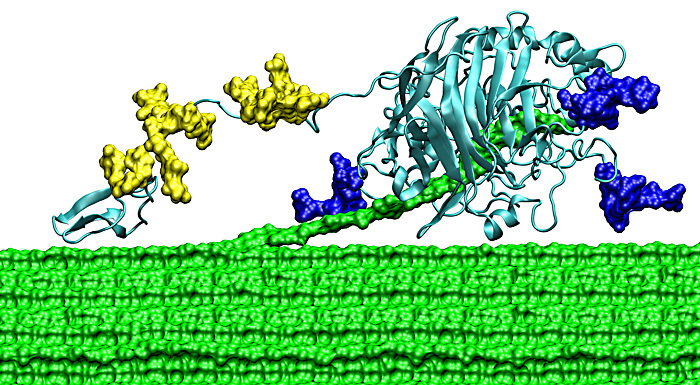 Figure 4 shows a model of an exocellulase shredding up some fibers from Dr GT Beckhams page - (isn't it awesome!?)(1). Unlike the active site of endocellulase which is situated in an open groove, the active site of exocellulase consists of a tunnel with several binding sites for the cellulose polymer. You will notice from Figure 4 that a small light blue domain extends on a thin "string" from the main body that has the polymer (green) passing through it. This is the carbohydrate binding module (CBM) that allows the enzyme to bind to cellulose. Not all cellulases have a CBM and it has been shown that cellulase catalytic activity does not always require the CBM even if its present. Two main pathways to cellulose hydrolysis exist: 1. Non-complexed cellusase systems. 2. Complexed cellulase systems (cellulosome). Lets look at Trichoderma reesei and its non-complexed cellulases. T. reesei is a fungus that has been extensively studied because of its high level of excretion of three cellulases, to the tune of 100g/L. T. reesei has relatively few cellulases (2 exocellulases, 8 endoglucanases and so far 7 beta-glucosidases and I think no endocellulases). Its success as a producer of biotechnology enzymes is due to its high expression under cellulase inducing conditions.The exocellulases are some of the most important enzymes. Cel7a of T. reesei (Figure 4) makes up 60% of the cellulases excreted and degrades cellulose from the reducing end. Cel6a makes up 15-20% and degrades cellulose from the non-reducing end. The production and purification of cellulases at sufficient levels is one of the main costs of lignocellulose utilization for biofuel and a great deal of research is carried out trying to optimize induction of cellulases, the speed with which they breakdown cellulose and into understanding the regulation of expression. For example, the highest producing cellulase strain of T. reesei in the public domain (i.e. not owned by a company) produces 30g/L of cellulases and is known as RUT30C. It was made by mutagenesis of the parent strain by UV irradiation and subsequent sequencing showed several mutations. One of the most important of these mutations was the truncation of the catabolite repressor protein 1 (cre1). Cre1 represses the expression of cellulases in the presence of more easily metabolizable carbohydrates (catabolites) such as glucose. This is because producing large enzymes such as cellulase is an energetic drain on the micro-organism and only performed when necessary for survival. Therefore turning off the repression of cellulase production, even in the presence of glucose, allows an increased yield of cellulases. A second area of improvement is in the post translational modifications of the enzyme. If you look at Figure 4, you will notice some yellow blobs attached to the protein. These are sugar molecules that are added during its expression and modified as it is excreted. They help with the expansion of the linker domain that connects the CBM to the catalytic domain (large light blue structure) and increase the reach of the enzyme as it moves along the polymer. Not all micro-organisms "do" glycosylation. For example, bacteria are a favoured hosts for protein expression because they are easier to break open than fungi, grow quickly and can be made to produce high quantities of protein. However, the way in which they glycosylate (add sugars to) proteins is different from that in fungi and even production of cellulase in other model fungi such as S. cerevisae leads to incorrect glycosylation. Lack of correct glycosylation leads to abberrant or less efficient protein production and function. A third area of improvement is to engineer in cellulases from other organisms. T reesei has a rather lower level beta-glucosidases and these are also inhibited by the end product glucose (2). By engineering the T. reesei to include the beta-glucososidase of another fungus, Aspergillus aculeatus, which is produced at a higher level and which is less susceptible to glucose inhibition, the cellulose hydrolysis rate is much improved. Thermal stability and rate of cellulose degradation are also aspects that can lead to cost savings in lignocellulose break down. 1.Beckham GT, J. Ståhlberg, B.C. Knott, M.E. Himmel, M.F. Crowley, M. Sandgren, M. Sørlie, C.M. Payne. Towards a molecular-level theory of carbohydrate processivity in glycoside hydrolases. Current Opinion in Biotechnology Volume 27, June 2014, Pages 96–106. 2. Tomohisa Hasunuma, Fumiyoshi Okazaki, Naoko Okai, Kiyotaka Y. Hara, Jun Ishii, Akihiko Kondo, A review of enzymes and microbes for lignocellulosic biorefinery and the possibility of their application to consolidated bioprocessing technology. Bioresource Technology 135 (2013) 513–522. Before we launch into cellulases, I want to cover a little bit on the structure and nomenclature of cellulose. I'll start with glucose and how its drawn and named. a) Glucose can be depicted linearly in the "Fisher projection" as shown below. b) In solution glucose adopts a ring structure that can be shown as the Hawthorn projection. When it is in its ring structure it is also known as glucopyranose. Pyranose consists of any structure that has 5 carbons and 1 oxygen in the ring. Glucopyranose is therefore glucose as the 5carbon1oxygen ring structure. Glucose in Fisher (top) and Hawthorn projections. Hawthorn projections show α (left) and β (right) conformations (link). c)α vs β. You will notice that the glucose Fisher projection can form two types of Hawthorn projections. In the α projection, the OH at C1 points downwards (or is in trans or axial orientation) compared with the CH2OH group whereas in the β projection, the OH at C1 points up (or is in cis or equitorial orientation) compared with the CH2OH group. This is then written as α-D-glucose or α-D-glucopyranose for the trans conformation and β-D-glucose/glucopyranose for the cis conformation. Whether the glucose is α or β affects the binding to the next monomer and the type of enzymes that are able cut the bonds. d) D vs L. You will also have noticed that I used the letter D.
The letters d and l (lower case) refer to the way in which plane polarised light would be rotated by a chiral center. A chiral center from our perspective is a carbon with for different groups attached. Clockwise rotation means dextroroatorary (d) and anticlockwise rotation is levorotatory (l). Dextro and Levo come from the latin for right and left. When sugars it gets a bit confusing because D and L (upper case) refers to the actual conformation of the chiral center at the carbon furthest from the carbonyl group in the Fisher projection (i.e. carbon 5) and in which direction the OH group on this carbon is pointing. D means that it is on the right side, L means that it is on the left side. You may also hear them called enantiomers. The D and L enatiomers are mirror images of each other. One particular carbon is referred to because there are often several chiral centers. Glucose has 4 for example. Naturally, only the D form of glucose occurs. Fisher projections of L and D glucose from here. * show chiral centers. Because of the way in which chiral centers were discovered, (it was based on the conformation of glyceraldehyde), L or D does not always refer accurately to the rotation direction of plane polarised light. For example, amino acids naturally occur in the L-form but for historical reasons it does not follow that this molecule always rotate light anticlockwise. In fact chemists use the R/S system....but we won't go into that.....If you want to dig deeper, google it up and here is the wiki page to get you started. Following any the links from which I have gather images will also give you more information. e) Joining β-D-glucopyranose together. So, celluose consist of D-anhydroglucopyranose joined together by β-1,4-glycosidic bonds to form an anhydrocellobiose unit. So, lets deconstruct. 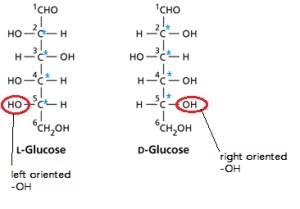 D means the D form, anhydro, means the loss of the hydroxyl group at the glycosidic bond (I think from carbon4) glucopyranose is the pyranose ring form of glucose. β means that the OH group at C1 is in the cis conformation and 1,4 means that the glycosidic bond is between carbon 1 of the first glucose unit and carbon 4 of the second glucose unit. Each glucopyranose unit is rotated 180 degrees with respect to the previous one and together they form a repeating unit known has anhydrocellubiose. This is shown below. 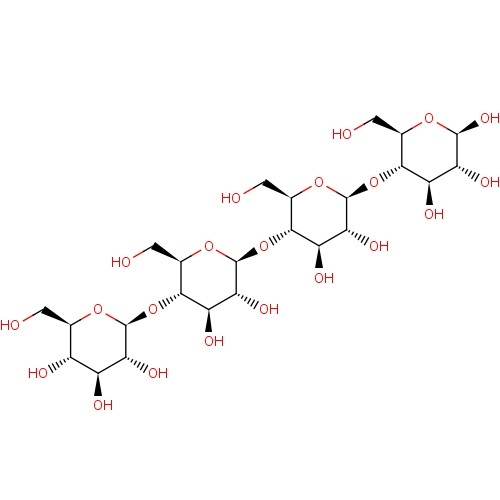 Structure of cellulose featuring anhydrocellobiose unit in the large square brackets (left) and cellulose I crystal structure (right) adapted from ref. 1. You will notice that the structure on the left is not drawn in the Hawthorn projection but in what is known as the Chair conformation - very slightly looks like a chair, right? This is the most stable form for glucose. The other orientation is known as the boat conformation - for more on this look here, point 3.2C. Cellulose can exist in several crystalline forms but the native one is referred to as cellulose I. Sheets of cellulose I stack on top of each other and form a fibril. Since they all stack in the same way, different parts of the stack will have different properties. For example, one end will have all the reducing ends, the other all the non-reducing ends. The edge of the crystal will have the edges of the glucose units. All this presents elements for the cellulases to tackle. Surrounding the fibers is hemicellulose and surrounding this is lignin. 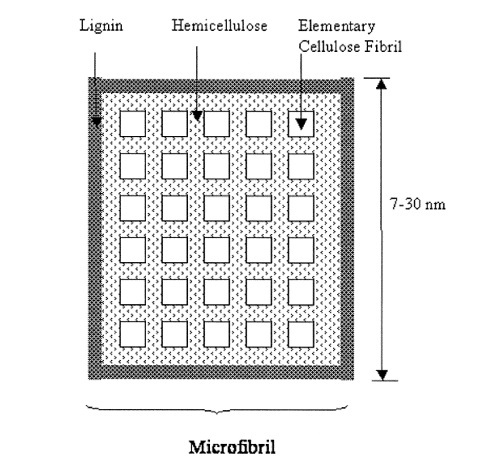 Reminiscent of a previous post, the figure (adapted from reference 1) below shows a depiction of a microfibril. Biofuels - gotta be good for everything right? No drilling, no using of reserves millions of years in the making; just using plants and bugs to get where you gotta go.....ok, so thats a teensy bit of an exaggeration, actually it could be quite a large exaggeration. Browsing my e-mail alert for the journal Trends in Biotechnology the other day, I came across this article, hot off the press: Sustainability considerations for integrated biorefineries by Adisa Azapagic at the University of Manchester (Trends in Biotechnolgy, Jan. 2014, Vol. 32, No. 1, page 1-4). Little did I know what lay in store. Environmentalists pride themselves (I like to think...) on considering the whole picture, which is what this article takes a stab at, rather competently I think. First off, when comparing biofuel vs petroleum fuel production and the overall impact this has, the life cycle from source to product must be taken into account. A) green house gas emission (GHG). Oh, I thought, what a doozy, biofuels win hands down. Not so fast my friends, in fact take a step back, if you will and take a gander at the lovely graph in figure 1, care of Dr. Azapagic. Figure 1. On a life-cycle basis, ethanol produced in an integrated biochemical refinery saves up to 104 g CO2 eq./MJ compared to petrol (85 g CO2 eq./MJ for petrol compared to −19 g CO2 eq./MJ for ethanol from UK poplar) owing to the credits for the co-products, in this case electricity, lactic acid, and acetic acid. Ethanol from sugar cane in Brazil saves 65 g CO2 eq./MJ, whereas ethanol from corn has much higher greenhouse gas (GHG) emissions than petrol. Land-use change (LUC) can increase GHG emissions significantly — in the case of biofuel from miscanthus to 310 g CO2 eq./MJ or 3.6 times higher than petrol. GHG emissions for all fuel options are from ‘cradle to grave’, encompassing production of the feedstocks and fuels as well as fuel combustion during use of vehicles. You see the shock factor, "Ethanol from US corn"? - its GHG emissions are 1.5x HIGHER than from a fossil fuel refinery! This is because of nitrous oxide emissions from fertilisers applied to the corn fields. Well its not organically grown, is it?! UK wheat and Brazilian sugar cane do better but its not in the negative. Noooo, you don't get that until you start in on the 2nd generation biofuels (the lignocellulose feeds stocks) and then comes another shocker. Miscanthus, a second generation fibrous grass that has GHG emissons 3.6x higher than a fossil fuel.....arghhhhh! WHY? B) LUC and Biodiversity See those letters - LUC - land use change. This is the term for changing the use of the land from say forest to corn, or from forest to miscanthus or from farm use to forest - a biofuel feedstock forest. This can have two effects: GHG emissions change and biodiversity changes. Forest land in the UK replaced by miscanthus resulted in the 310 g CO2 eq./MJ (Figure 1). Biodiversity also decreased as a monoculture of miscanthus is obviously less diverse than a forest. However a feedstock forest could be more diverse than a field previously used for growing wheat, so the biodiversity issue works both ways. C) Water use. The source of biofuel feedstock varies a great deal in the amount of water required to grow it. Feedstock from agricultural waste or forestry waste requires little or no water, whereas energy crops such as miscanthus require more water than arable crops such as corn because of a longer growing season. Water has to be transported from somewhere and this will effect GHG and stress the place from which it was taken. Biorefineries themselves require relatively little water use. So, like biodivesity, water use can have positive or negative impact. Well, maybe not positive but at least, less negative. D) Other considerations in the bio(fuel) life cycle are environmental impacts such as soil pollution (acidification, human toxicity etc), emissions of sulfur dioxide, nitric oxide, nitrite etc. There are also economic considerations such as feedstock costs, capital cost (the commercial biorefineries using second generation feedstock have to be built - the US Department of Energy has a website showing sites where they are being built) and the cost of the biofuel itself. Then there are social considerations such as jobs and regional development, health issues (e.g. pesticides cause cancer and death, particulate emission from biomass handling affects air quality), human labour rights, land availability and food prices (energy crops might displace food crops and drive up food prices) and affects on future generations. Curiously, the article does not mention the other hazards involved in the petrolum industry such as the contamination of water ways by fracking or the great environmental disasters caused during drilling for oil, many of which we never even hear about. The chance for that kind of disaster seems much less likely in biofuel production. Still, there is a GREAT DEAL to consider while we go about the nitty gritty of finding exactly how a cellulase chews ups cellulose. It really IS a BIG picture but I believe the conclusion of the article; if managed correctly, biofuels really could be a very good thing. To read the article for yourself, go here. Fuels for Biofuels part 4: lignocelluose as a biofuel: pretreatment. One of the problems with lignocellulosic feedstocks is the complexity of composition and the presence of lignin - the polymer that allows plants to fill their cells with a rigid mass and stand up straight - see my post on plant structure. Wood and the fibrous stems of crops and other plants have an abundance of lignin and this needs to be broken down before the cellulose fibers that provide the edible stuff for micro-organisms becomes accessible. Simultaneously the hemicellulose and cellulose fibers need to be disrupted to make them more readily digestible. Figure 1 shows the a schematic of conversion of lignocelluosic feedstock to biofuel. In this post I will discuss pretreatment processes (the green bit in Figure 1). Figure 1. Converting lignocellulose to biofuel (4). The basic process for biological conversion of lignocellulose to ethanol is a pretreatment to break down the wood polymers, followed by enzyme mediated hydrolysis of those polymers to produce monosaccharides that can then be fermented by micro-organism to produce ethanol. 1) Dilute acid pretreatment uses low levels of acid (e.g. 2% sulfuric acid) and heat (190dC). Compounds called furferals are produced which inhibit fermentation but are a value added co-product. The process works best with hardwoods rather than softwoods and also produces a condensed form of lignin that is of little value apart from as boiler fuel. 2) Steam explosion (Figure 2) also uses dilute acid and combines chemical pretreatment with size reduction in one step increasing efficiency. However it is energy intensive, has relatively low sugar recovery, though this can be improved, and works better with hardwoods than with softwoods. It has not yet been commercially scaled (2010). 3) Organosolv uses organic solvents such as ethanol, acetone, butanol or polyethylene glycol. To date ethanol has proven to be the most economical as it is cheap and easy to recover even if it is not the most efficient. Organosolv processes produce high quality lignin and celluose which has good digestibility. Large quantities of ethanol are required and the process is energy intense. As a result commercial viability lies in the recovery of the high quality value added products that are a by-product of this process. 4) The most promising pretreatment however is the Sulfate Process (also known as the Kraft Process or Sulfite pretreatment to Overcome Recalcitrance of Lignocellulose (SORL). As above, dilute acid is used together with the addition of sulfite (for the chemical reaction, click here). Conditions are relatively mild at 130-190dC and produce low amounts of fermentation inhibitors but also lignosulfonate which is a good value added coproduct. Additionally the process softens lignin by increasing its hydrophilicity which reduces energy consumption and aids downstream polymer digestion. Economy is also increased because the process can be carried out directly on wood chips without further size decrease. 5) Ionic liquid treatment is a relatively recent approach using salts that are liquid at room temperature (figure 3) and that are able to dissolve cellulose and lignin. However, more research is needed into ionic salt recovery from the dissolved biomass before they can be commercially viable. 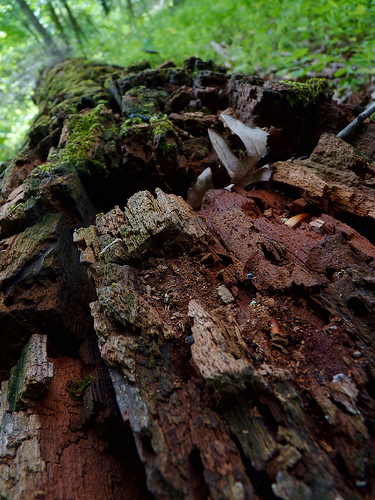 a quiet wood and step over or on soft rotting branches (Figure 4), you'll understand even better that there are biological processes capable of breaking down lignin. These involve enzymes and as we will discuss in the next post, enzymes are a major economic burden in biofuel production. Their advantage is that they require mild conditions and consolidation of the breakdown of lignin (pretreatment), cellulose hydrolysis and fermentation could potentially all be done in one step, substantially reducing cost. There'll be more on this in a subsequent post I think. In each pretreatment scenario, the lignin and other non-digestible material must be separated from the degraded cellulose fibers. How this occurs depends on the pretreatment type and the details of the pretreatment. For example in organosolv pretreatment, temperature and solvent (e.g. ethanol) to water ratio effect the morphology of lignin. The many aspects of such fractionation are beyond the scope of this blog and at this moment, my interest! As discussed in my April blog post, wood consists of three polymers - cellulose, hemicellulose and lignin. Have a look back to remind yourself of their structures. Wood cellulose has a twist to the arrangement of the polymers and to be relatively amorphous, possible making it more amendable to breakdown. Soft and hardwood hemicellulose differs in the composition of the monosaccarhides that predominate and in chemical linkages between the monosaccharides. While cellulose and hemicellulose are polysaccharides, lignin is an unstructured polymer of monolignols and again the composition and structure of lignins varies between hardwoods and softwoods. As the chemical links joining the monomers are all different, so are the enzymes necessary to break them. In order to understand the best procedure for doing this, much research is performed into the structure and composition of the three polymers and to how changes in the genetic components of their synthesis pathways can ease the breakdown pathway during biofuel production without affecting plant vigor (3). Other avenues of genetically engineering plants have also been explored (5) and these include increasing the amount of cellulose, engineering plants to produce their own cellulase and reducing the amount of lignin in the plant. Of course, planting great swaths of genetically engineered trees or grasses is controversial. This topic will have its own post in the future. As interesting aside, there are two ways of converting wood to biofuel: biological and thermal. Above we discussed pretreatment for biological conversion. Thermal conversion (1) has two pathways: gasification and pyrolysis. Gasification uses high heat and pressure and yields carbon monoxide and hydrogen from which a variety of fuels can be catalytically obtained. Pyrolysis (breakdown by fire!) uses heat in the absence of oxygen to generate bio-oils and char. Bio-oil can lead to a number of different products but requires further treatment before it can be used. Char is the solid carbon enriched material that remains. It can be used as a soil fertilizer and perhaps as a method of carbon sequestration to remove CO2 from the atmosphere in attempts to mitigate climate change.